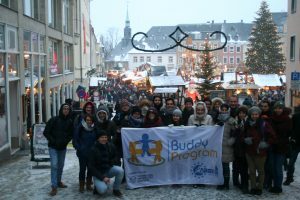 On december 10th, 2017 the Buddy-Program of AEGEE-Dresden organized a trip to the secret christmas capital Annaberg-Buchholz. 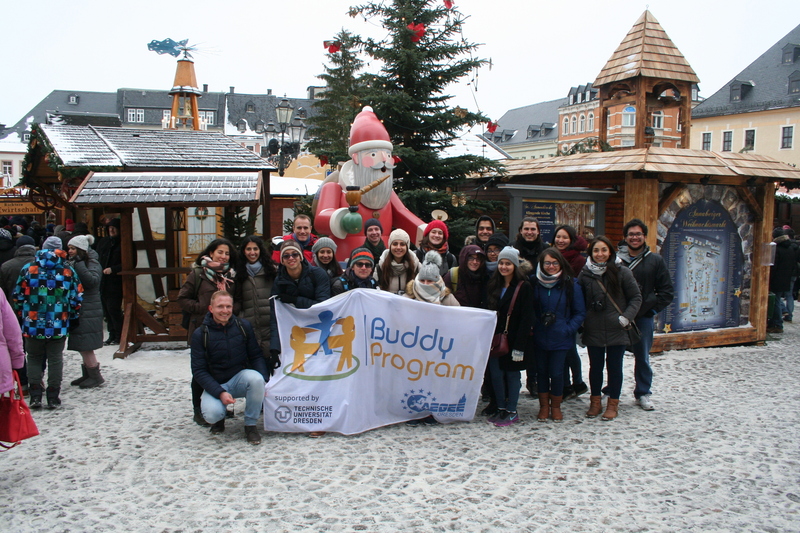 24 international students from all over the world and two german buddies were guided by two AEGEE-members through german christmas traditions.The Ore Mountains and its capital Annaberg-Buchholz are known in Germany as the origin of christmas decoration like Nutcrackers, Rauchermen, Christmas Pyramids and light arcs. Founded at the end of the 15th century Annaberg became one of the biggest, richest and most important towns in Saxony. The huge amount of examined silver were the base of Saxony´s wealth and importance in the following centuries. In times without mining the citizens of the Ore mountains were looking for new fields of labour and enforced handcrafts such as wood carving and lace making. After a guided tour through the town with information about history, the first highlight of the day was the visit of a middle age mine in the town´s centre. The christmas market which is awarded every year by many magazines and TV Channels as the most beautiful christmas market in Germany was the next point on the agenda. Temperatures below -10° C, snow and a brass music concert increased the christmas feeling tremendously. After free time at the Christmas Market a miners ceremony in the St. Anna church was watched next. The spirit of christmas was noticeable everywhere. After a short walk through the snow-covered town we reached the fire station of Annaberg. All participants could taste traditional christmas food and drinks in a warm ambiance illuminated by candlelight. Everybody was relaxed and happy as a loud door knocking disturbed the silence and Gemütlichkeit. The knocking came from Santa Claus who was entering the room with a huge bag of presents. Unfortunately for all international students, the german Santa Claus gives presents to everyone just as reward of a small performance. Everybody was asked to recite a poem or to sing a song. All participants enjoyed songs and poems from different countries and in different languages. All students did well and received a small present which will hopefully remind them of a wonderful christmas experience. 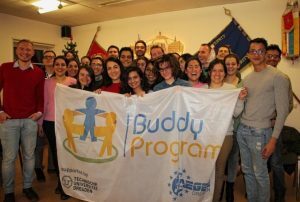 The whole trip was funded by the TU Dresden Kulturbüro which kept the participation fee low.